A comparison between the actual IFMIF accelerator and the prototype LIPAc presently under construction in Rokkasho. Both accelerators lead the linear ion accelerators performance worldwide. On 20-21 August, several meetings took place in Rokkasho, Japan, between the CODAC teams in charge of the machine protection and interlocks of ITER and the International Fusion Materials Irradiation Facility (IFMIF) team. IFMIF is one of the projects of the Broader Approach agreement between Japan and Europe, which was signed to support ITER and achieve an early realization of fusion energy for peaceful purposes. In particular, IFMIF must present results in parallel with ITER operation since these will allow the design of DEMO by qualifying the materials capable of withstanding the neutron flux that a commercial nuclear nusion reactor will undergo. The aim of the meetings was to establish a first contact between the controls groups of both "brother" organizations focusing on the development of the machine protection systems. The sessions started with a seminar by Antonio Vergara (ITER) summarizing his experience on the design, implementation and commissioning of machine protection systems for high-energy physics accelerators like the Large Hadron Collider at CERN and how the lessons learned can be applied to ITER and IFMIF interlocks. The presentation was followed by a series of meetings organized by the IFMIF/ Engineering Validation and Engineering Design Activities (EVEDA) Project Leader, Juan Knaster. IFMIF plant will bombard suitable materials reaching more than 20 displacements per atom (dpa)/year (this value means that in average an atom has been displaced from its lattice 20 times per year). This would allow reaching within a few years of operation the 150 dpa expected at the end of life of a commercial reactor, and with neutrons at an energy spectrum around the 14 MeV (typical of deuterium-tritium nuclear fusion). The aim of the meetings was to establish a first contact between the controls groups of both'' brother'' organizations focusing on the development of the machine protection systems. The neutron flux will be obtained by accelerating at 40 MeV two parallel beams of 125 mA deuteron current and making them collide onto a liquid lithium screen. The accelerator validation will be achieved by the installation, commissioning and operation of the Linear IFMIF Accelerator Prototype ( LIPAc) which will accelerate a current of 125 mA deuterons at 9 MeV. 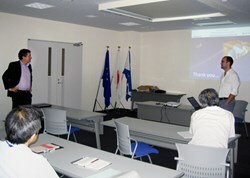 The current status of the LIPAc control, safety and machine protection systems were presented and discussed. The LIPAc, like ITER, is also based on in-kind procurements. The collaborating organizations in Japan and Europe are in charge of building and installing the different plant systems of the accelerator's prototype, including their local controls, and safety and machine protection systems. The international team in Rokkasho is in charge of the development of the central control systems and the entire integration and commissioning. Not surprisingly, they are facing many of the issues and challenges related to the integration of the I&C systems that the CODAC team at ITER has been solving during the last years by the development of tools such as the Plant Control Design Handbook (a new version will be released at the beginning of 2013) and the CODAC Core System software. One of the main meeting conclusions was that the similarities between the two project control systems—the fact that both are based on EPICS and the equivalent procurement strategy—makes a more detailed analysis of the potential collaboration between ITER and IFMIF very desirable. The potential to share the tools and procedures and apply knowledge and lessons learned from the ITER controls and interlocks teams to the design and implementation of the LIPAc control systems could result in an efficient and cost-effective collaborative approach.